Step 4 of the Orca Bay Mystery came out on Friday. I have worked hard on this step for a few days over the weekend. I am not using the suggested Red but Pink instead. I have a red pop up once in a while as Pink is really just a shade of red. The pile on the left has all the paper removed and the smaller pile to the right still needs the paper removed. I did do all the blocks with Bonnie's paper foundation method. To check out more of what other bloggers are doing check out Bonnie's Linky thing. There are a few people using different colours. Some of my local quilt friends are working hard on this mystery too (Kathy, Kathryn, Elizabeth, Betty, Arley). It will be fun to see how many finish and can keep up. My mom plans to do this but has only started step one and then went traveling. She has step two printed and sealed in an envelope. She will have to do the same for step 3 and 4 when she gets home. My ante Arley is working on her's. I think it is because she did the last two mysteries and they turned out so well that it has encouraged me to do this one. It is also Design Wall Monday over at Patchwork Times . 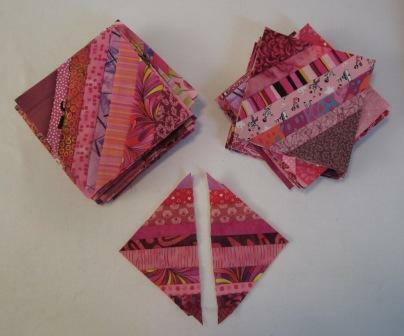 I am working on doing some scrap blocks for a rainbow quilt. It was over at Soscrappy that I saw This Quilt. I have to make one like it. 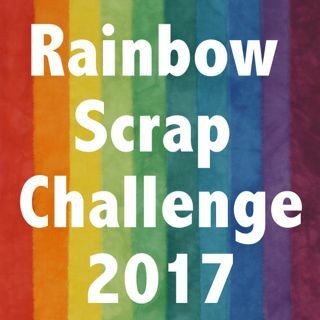 On Saturdays she hosts 2011 Rainbow Scrap Challenge. I only started in Nov 2011 (not Jan) but I love the quilt she has made. The month of Dec is Red and Green. These are mine Pink and Lime Green, not very Christmas like. I have some Reds set aside to do a good red block yet this month. And I can sort out the darker green ones for later this month too. If you have noticed I am not doing the inside on my blocks the same, each is different. The middle part of my blocks are 6" and anything goes. Then I put a 1" white around then a 2" strip pieced, to finish my block at 12". Happy sewing this week. I planning to get more long arm quilt done, then some baking tonight. 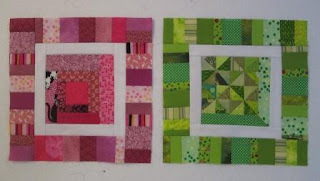 Oh, I like your pink and lime better than traditional red and greens, these should be your 'good' blocks. Really like the way you are doing your centers, too. Very pretty colors. I like brights more than anything. I love your rainbow blocks. They are going to look beautiful when you have a collection going. So glad you decided to get a head start on next year. Such a better way to think of it than being behind on last year! beautiful combination of pinks and reds. Your Orca blocks are looking great! Love the rainbow blocks -- very cool! I'll be filing this idea away as I'd like to play with it myself - thanks for the inspiration! Wow you know so many people doing Orca Bay. I only have on line friends doing it. I do love the strings and the rainbow quilt squares, love the centers. So far it is going great, I am loving my colors and yours. I need to get some new pictures posted. i have a few of every step but prob won't catch up til after Christmas. Glad I could inspire you to try this mystery I think it will be another great one. Smiley quilter otherwise known as Aunt Arley.